The rules were re-written compared to earlier versions, but essentially didn’t change. At about 30 pages, it is definitely one of the shorter systems around. The system is in principle a percentile system: All die rolls are done with percentile dice (or in some cases with a d10). The stats and talents of a character also are expressed in percentages. The character generation uses an unusual but easy to understand system combining default values, die rolls and point assignments. In principle you roll up a number of percentage points you then may distribute freely over the skills a character has. This die rolling of course means that starting characters are potentially differently effective, but this isn’t as bad in this system because the main task – solving crimes – should not be handled by die rolls but by thinking. After the short rules there is a very detailed background part describing the Victorian world comprehensively. Special attention is paid to tools we consider self-evident but which were still investigated in the Victorian era, such as anthropometry/Bertillonage (an early version of biometrics based on the sizes of specific body parts) end dactyloscopy (fingerprints), two methods still in their infancy at the time and occasionally ridiculed. The everyday life in Victorian times also is described thoroughly. Fashions, social environment (that women’s rights still had to be discovered is addressed in the book several times), the value of money, an extensive description of London and even a good description of Sherlock Holmes make the reader happy. The material offered is very elaborate, and I couldn’t find any inconsistencies or error. The rulebook closes with an adventure titled Family Fortune. At more than 30 pages it, too, is very detailed – many a publicher would publish an adventure of this size not in the basic rule book but as a separayte adventure, while the rulebook contained a shorter adventure. Even though the background material is very detailed – and the game master has to be thoroughly prepared if he wants to include all details – a normal playing group will be hard-pressed to conclude the adventure in the suggested eight hours playing time, if the players aren’t already used to detective adventures. Detective adventures are always hard to split over two Sessions, because players have a nasty tendency to forget the most important clues. The situation presented and the cases, however, make up fot this: It is very engaging to dive deeper into the history of the publican’s family. The book closes with numerous tables. I don’t want to omit mentioning one small nitpick. Firstly, I’d have loved to find an overview how to write a detective adventure. A description, which clues are usually easier to discover or not, would be very useful. The problem is well-known from other adventures, where the players seemingly take pains to ignore the most important clues. A producer of detective RPGs, I suspect, should have some experience with this and it would have been nice ifg the had shared their experiences with the reader. The illustrations are very good, Sabine Weiss and Sylvia Schlüter succeed in giving a great optical impression of the Gaslight era to the reader. The translation also has to be considered very successful. I could find no really bad translations, the only thing I found occasionally jarring were hyphens between syllables that appeared mid-line, probably from resizing text boxes during setting. Also, the cover says &apos;Basic Roleplaying System&apos; – one should not confuse it with Chaosium’s BRP, which is a completely different game. 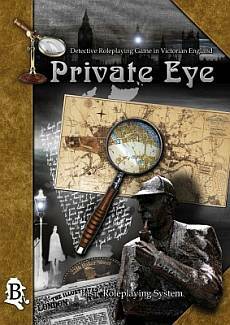 Is Private Eye advisable, considering there already are numerous other roleplaying systems with a Victorian backdrop (Cthulhu Gaslight, Victoriana, Castle Falkenstein, Space 1899 &c)? I’d say definitely, because Private Eye wants to remain explicitly &apos;terrestrial&apos; (i.e., it allows for neither magic nor supernatural monsters), which means that the background part in and of itself is extremely useful.